Profile: Joe joined Marine in July 2016 after being released by Bristol City at the end of the 2015/16 season. 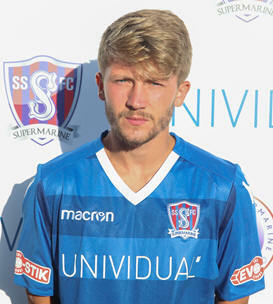 He made his Marine debut in the friendly again Swindon Town and a couple of solid performances in the following friendlies persuaded former manager Dave Webb to sign him on Southern League forms. The last two seasons have seen him become a regular name in the starting eleven and chipped in with 12 goals in our promotion campaign last season. He can play either on the right side of midfield or further forward and likes nothing better than going forward to take on the opposing defence. He is a technically gifted player with plenty of pace and courage.